Yes, you see that right. That’s cornbread batter on top of a skillet ‘o chili. Read the recipe right away! I got the idea for this at a food styling/photography seminar that I was very, very late to. Thanks a lot, DFW traffic. It’s officially impossible to get from Dallas to Fort Worth during rush hour in anything less than 1.5 hours, which is kind of amazing considering they are only 35 miles apart and we only have like 3 million people in the whole metroplex. This isn’t effing Manila. There wasn’t even a wreck, it was just plain traffic. Enough ranting, onto the food. 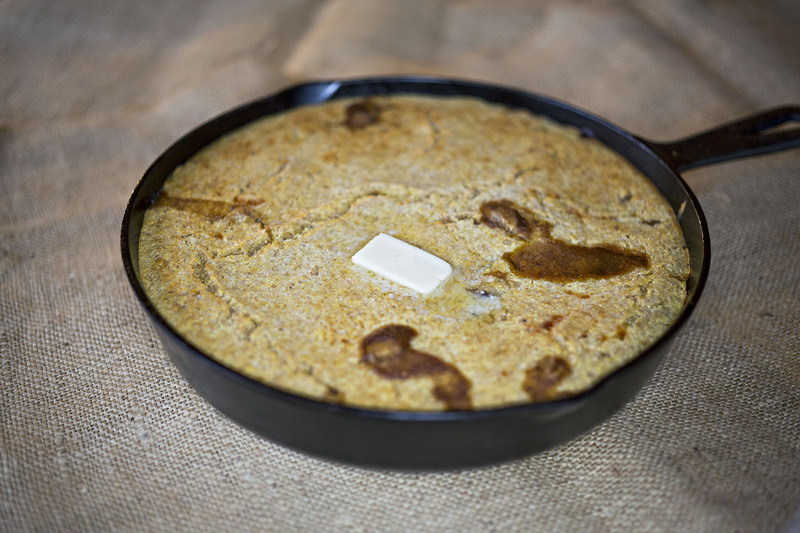 This food photographer was showing some of his work, with tips and suggestions and the like, and up came this cast iron skillet of cornbread that clearly had something awesome bubbling underneath. I still don’t know what exactly was underneath the cornbread in that photo, but in my mind chili was the immediate first thing to do. 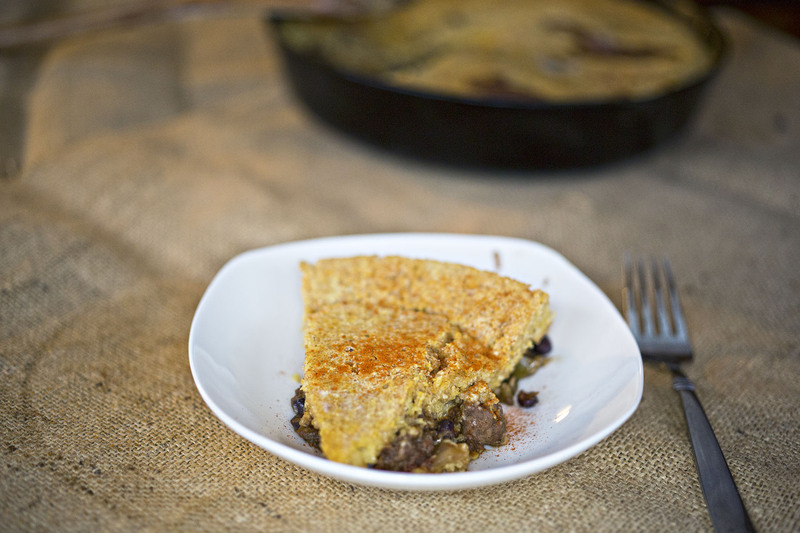 The process is fairly simple: make chili in a cast iron skillet, top with cornbread batter, bake until golden and cracked. I must say that this is incredibly delicious, never mind that it’s kind of a cool thing to do. There are, of course, some notes. My recipe makes a quick chili and uses a box of cornbread mix and everything comes together in about a half an hour. You can certainly make this with your special chili recipe and/or your special cornbread recipe, of which the timing can increase exponentially. I bet it would be good with a special buttermilk cornbread on top though. Another thing is the issue of vessels. My skillet wasn’t really large enough to make the chili in (even though it was plenty big enough to hold the majority of it with room for the cornbread batter). So if your skillet is too small, make it in a different pot, then put it all in the skillet for the oven. If your pots/pans are more limited, make the chili then pour it into any corning ware or pyrex baking dish and add the batter on top. All you do from there is bake it to your cornbread recipe’s instructions, the chili on the bottom will be just fine. Heat a cast iron skillet (or large pot, if your skillet is small) to medium and brown the meat. Add the onion and continue to cook until translucent. Add the garlic, bell pepper and spices, and cook until the garlic is fragrant (2-3 minutes). Add salt and pepper to taste. Put in the canned tomatoes and about a half cup of red wine, creating just enough liquid to let everything simmer. You don't want it too watery. Let everything simmer until the liquid has reduced to a thick, gravy-like consistency. Meanwhile, preheat the oven to 400 (or whatever your cornbread directions say) and mix together your cornbread batter. When the meat is tender and the chili has reduced, transfer your chili to a cast iron skillet (if it's not already in one) or a baking dish. Put a layer of shredded cheese on top of the chili, then pour the batter over the whole thing. Cook according to the cornbread's package directions. Schmear with butter on the top of the cornbread for serving. Non game substitution: Anything ground that goes good in chili! You could even do shredded chicken or really whatever strikes your fancy! Vegetarian substitution: Just take out the meat and double the beans, or use your favorite vegetarian chili recipe.